This page provides you with Vice President Of Marketing resume samples that you can use for inspiration in writing your own resume, or for creating one through our easy-to-use resume builder. Below you'll find our how-to section that will guide you through each section of a Vice president of marketing resume. Vice President of Marketing: wow, that sounds fancy. You might have already had this position or it might only been a dream of yours, but if you were looking for the best Vice President of Marketing resume sample, don’t look any further, you have reached your destination. Vice Presidents report directly to the president or CEO, and are typically given a broad but distinct set of responsibilities. As Vice President of Marketing, you will be responsible for leading the marketing department, heading marketing campaigns, and promoting your brand. The vice president of marketing works across all channels to drive customer acquisition and retention. That’s a lot of responsibility, but don’t worry: we are here to help you with the best VP of Marketing resume sample: we have helped millions of professionals like you get the job they have always dreamt of! How to Write Resume for Vice President of Marketing? Your vice president of marketing resume should show your experience with retail and product marketing as well as social media, SEO, and other aspects of digital marketing. As this is also a leadership position, your resume should reflect your ability to manage and inspire teams, articulate vision, and develop strategy. Your vice president of marketing resume should be uniquely targeted to the role you are applying for. Use a resume format that is professional and can highlight your leadership and management skills. Your resume should demonstrate your strategic capabilities and decision-making prowess with concrete examples of your contributions in previous positions. 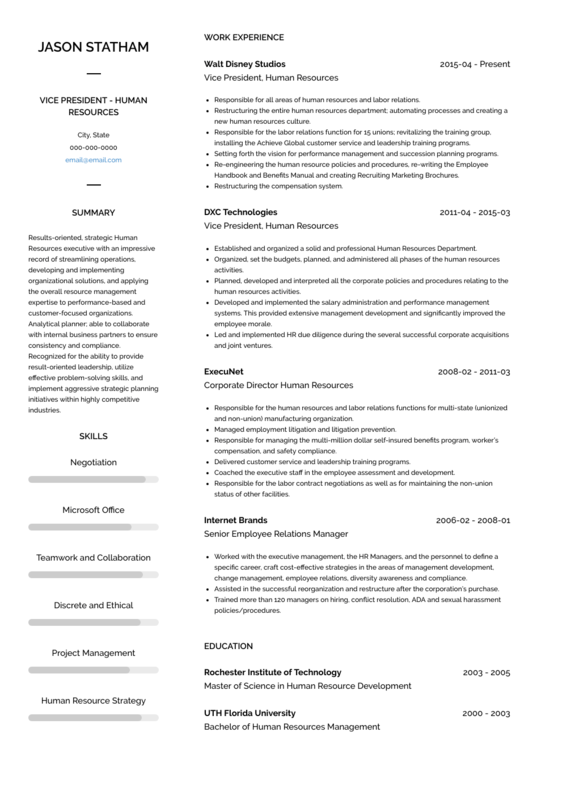 Last but not least, don’t forget to save it as a .pdf file to keep your resume layout intact. In your summary section, sell yourself as a devoted marketer and passionate leader. This section is where you offer your elevator pitch, briefly summarizing who you are and what you are capable of. This is where, in succinct paragraph form, you can show your enthusiasm for leading teams, developing big-picture vision, and ensuring strong brand promotion. Fill this section with technical terms. Due to the high ranking of your job position, you would probably have worked in different employments. This section is for you to prove to your employer that you have served in different leadership and top positions that makes you a very good fit for the job position in question. Every job position that you write down show showcase your different responsibilities, the duration spent at such employment and even the awards and achievements of such employments. In this section, write down the different career milestones which you have experienced. List your work experience by starting with the most recent and relevant ones. The educational background of a Vice President of Marketing is very vital to his competence. This education background should be clearly stated. Every degree or certificate earned which is relevant to the job position should be properly stated and accounted for. The employer wants to understand the type of training, either formal or not which makes you qualified for the position. In this section, list all your basic formal training and then go on to add the different relevant qualifications and certifications that you have. Say you are good at Excel: really? Finally, if you are looking for the best Vice President of Marketing resume templates, you should check this masterpiece we have been working on here : many professionals like you have successfully used it to take their career to the next level.